Amazon.com description: Product Description: Dan Shapiro's mother was always an avid gardener who tortured her neighbors with excessive quantities of zucchini, squash, and tomatoes. When Dan was twenty years old, he was diagnosed with cancer. Leaving Vassar to move home with his parents, he informed them that he'd learned marijuana would help him endure the unpleasant side effects of chemotherapy. His vehemently anti-drug mother was certain smoking dope would lead to his ruin. He argued. She countered. He gave up. Then suddenly she came around and gave him money to buy the pot he needed. But when he returned with the small Baggie, she was incredulous. She held out her hand and said, "Give me the seeds." Eleven-foot-high marijuana plants, at first coyly hidden by a row of sunflowers, soon towered over the backyard. It would be nine years before Dan, by then a parent himself, would fully understand the powerful forces behind his mother's decision to plant those seeds in her garden. At times hilarious, but always intimate, honest, and luminous, Mom's Marijuana takes us from Dan's first diagnosis to his second relapse, to -- finally -- sustained, thriving health. Whether it's the decision to paint himself green to frighten his mother after radiation treatment, fighting to survive while surrendering to love with an oncology nurse, or learning the meaning of life and family from events once taken for granted, Dan Shapiro tells his story with a wit and grace that made him a favorite on National Public Radio's All Things Considered. 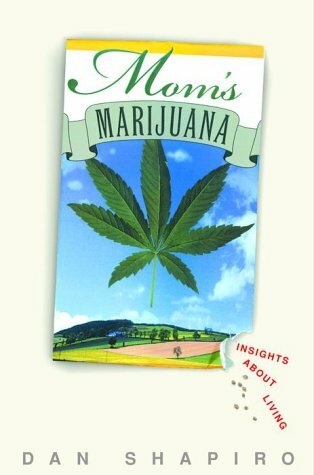 Mom's Marijuana takes us on a literary skinny dip; exposed, cold, and raw, we're plunged into a compulsively, almost obsessively readable account of life with cancer and the exuberant redemption of health. Mom's Marijuana shows us that it's when the pulse and rhythm of life are stirred violently that we're made to learn the beauty of multitudes, of finding what it is that makes us so brutally vulnerable, plain, and godly all at once. About: The author shares his pain, humorous moments, and insights after being diagnosed with cancer, revealing his response to chemotherapy, fighting with his anti-drug mother over the medical use of marijuana, and his eventual survival.